Tough-minded and typically idiosyncratic, here is Chandler on Chandler, the mystery novel, writing, Hollywood, TV, publishing, cats, and famous crimes. This skillfully edited selection of letters, articles, and notes also includes the short story "A Couple of Writers" and the first chapters of Chandler's last Philip Marlowe novel, The Poodle Springs Story, left unfinished at his death. Paul Skenazy has provided a new introduction for this edition as well as a new selected bibliography. Raymond Chandler (1888-1959) was born in Chicago but raised in London, returning to the U.S. to live in California in 1919. 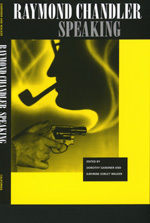 His first story, "Blackmailers Don't Shoot," was published in 1933 and The Big Sleep, his first novel, in 1939.Paul Skenazy is the author of The New Wild West: The Urban Mysteries of Dashiell Hammett and Raymond Chandler and he is Professor of American Literature at the University of California, Santa Cruz.